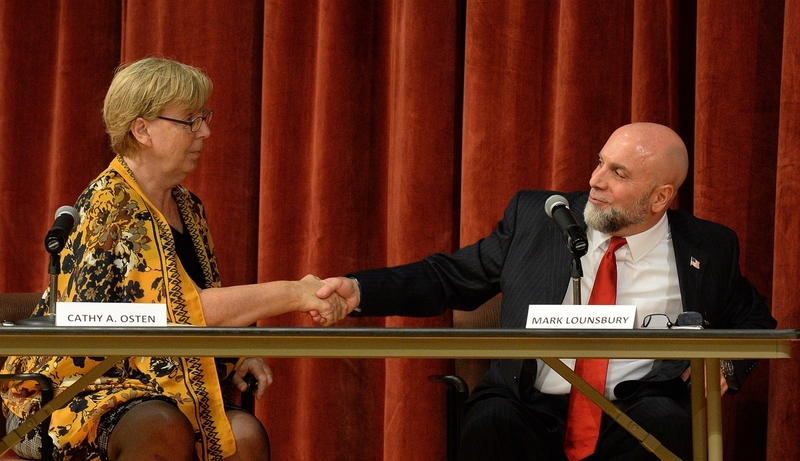 Norwich — Democratic state Sen. Cathy Osten of Sprague touted what she called her “laser-like” focus on job creation during a debate here Wednesday night with her Republican challenger, Mark Lounsbury, who also lives in Sprague. Osten, 63, seeking a fourth term in the Senate, is serving her sixth term as Sprague’s first selectwoman. She co-chairs the state legislature’s Appropriations Committee. Lounsbury, 57, a retired Norwich police detective, served one term on the Sprague Board of Finance before failing to unseat Osten last year in a bid for the first selectman’s seat. In an interview prior to the debate, he said he ran for first selectman because he was aware of “irregularities” in the town budget and wanted to address them. Osten went public this week with her suspicion that Lounsbury was behind a complaint that prompted FBI agents to speak to townspeople in recent weeks. In response to a debate question, she said she “assumed” Lounsbury was involved. About 40 people attended the debate at the Kelly Magnet Middle School. It was sponsored by The Day and the Chamber of Commerce of Eastern Connecticut, with help from the League of Women Voters of Southeastern Connecticut. The 19th Senate District comprises Columbia, Franklin, Hebron, Lebanon, Ledyard, Lisbon, Marlborough, part of Montville, Norwich and Sprague. Osten said the state’s deficit is the fault of officeholders from both political parties who failed for years to deal with growing debt and state employee pension liabilities. She said the legislature has made progress in recent years, an assertion Lounsbury disputed. Osten disagreed with Lounsbury’s suggested use of the state’s Rainy Day Fund, which she said must be kept available for emergencies. Lounsbury said that with the state in danger of defaulting, a contract reached in the past year with state employee unions should be “revisited, re-opened and renegotiated.” Osten said she was a supporter of the deal and that it has addressed some of the most costly issues, such as placing new employees on 401(k) retirement plans rather than pensions. She said the size of the state’s workforce has been significantly reduced through attrition in recent years. Lounsbury expressed his frustration with state taxes, which he said are to blame for businesses and residents fleeing the state. He stopped short of embracing Republican gubernatorial candidate Bob Stefanowski’s plan to phase out the state income tax. “Get rid of some of these other taxes,” he said, referring to the gas tax, the sales tax and others. Osten panned Stefanowski's plan, saying it could jeopardize funding for municipalities, education, community colleges and the University of Connecticut. A supporter of increases in the minimum wage, Osten said she favors pushing it to $15 an hour in increments. Lounsbury said the minimum wage shouldn’t be set arbitrarily but instead tied to the consumer price index. Lounsbury said he had not read a new state law banning so-called bump stocks, devices that increase the deadliness of semi-automatic weapons, but indicated he was not a fan of gun control generally. Osten eventually supported the ban, though, she said, she voted against gun-control legislation passed in the wake of the Sandy Hook shootings because she believed it went too far. The candidates agreed that more attention and resources should be devoted to mental health issues related to gun violence. They also agreed that the long-term effects of marijuana should be studied further before the state considers legalizing its recreational use among adults 21 and older. While Osten said she supports installing highway tolls to help fund infrastructure improvements, Lounsbury said the state risked losing federal funds if it went that route. Osten discounted that notion, saying her opponent hadn’t researched the issue. Responding to a question about the federal government’s rollback of environmental protections, Lounsbury said he’s seen no evidence of manmade causes of climate change. “You need to show me some more proof because you haven’t shown me any,” he said.